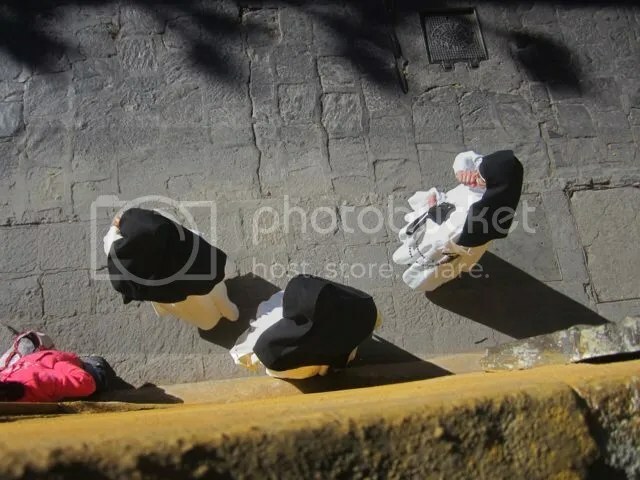 Posted on February 15, 2014, in 5-7-5, Guanajuato, Mexico, San Miguel de Allende, Shadow Shot Sunday 2 and tagged evening, Guanajuato, Mexico, miles, pilgrims, San Miguel de Allende, shadows, way. Bookmark the permalink. 25 Comments. Thanks, Dina. Glad you could stop by today. Unusual angle – had to do a doubletake! Superb bright colors and interesting shadows. Great shot from the top. Such unyielding straight shadows from the nuns and yet soft welcoming shadows in front of them … complex contrasts, just like life ? This was a very unusual position taking a photo from above. Thanks for the comment – glad you spotted the tiny fly but the shadows for SSSunday are actually in the *other* shots!! Thanks for hosting these memes. Oh, I hope you don’t think I was being critical or sarcastic. I was just enjoying your photo in my own quirky way! I love this angle and the mystery the shot holds. Oh! Oh! Oh! This is exquisite!! such an unusual photo looking down- I like this alot! So love how the soft shadows seem to be creeping toward the sharper shadows of the nuns. Delightful perspective. Beautiful angle – I thought of the photo of Nuns sitting at an outdoor bar, where their lower halves looked like show girl legs… because that’s what the legs of the chairs were painted to look like. While on journeys we need to enjoy ourselves too. I miss seeing the nuns dressed in habits such as this. The first time I saw one of the nuns with him I’d taught in her new habit I did not recognize her at first! interesting perspective of these pilgrims! What great shot – very intriguing perspective! Love the haiku as well. Beautiful. I love the perspective of this shot.